Long time lurker, bought my S1 about two years ago after much research, including on this forum. Thanks for all the info. I figured it was time for me to contribute. After becoming frustrated with the factory optional drain kit (not a great design) I fooled around with a couple different plumbing techniques. First I tried plumbing a line out the back of the tray. That worked OK, but it was a PITA to remove (and I found that I usually burned myself on the group head 5 or 6 times each time I disassembled the plumbing, given the way my hands had to reach in to unhook it). I finally went to a much simpler setup, with a press-in plumbing fitting (just like JG, but whatever brand Home Depot carries). It is a 3/8" right angle fitting that the tubing just slides into. The other side is threaded, and screws right into the bottom of the drip tray. I drilled four holes in the sided of the threaded section to help with drainage. All in all, it works really great, and has never leaked. I can rinse it out with lots of water and have never had any problems, wither with leakage or with any smells. Here's a link to a couple pictures for anyone interested. Thanks, mgannon, we needed that. Drainage seems to be one of the last frontiers, doesn't it? Actually, the supply line is the braided steel one that came with the unit. The plastic line that you're seeing is actually the drain line. Works fantastic. Never backs up, drains almost completely (but for the ridges inside the tray). Basically what I did over a year ago to mine after the stock drain failed me. I had to use plumbers putty to keep it from leaking, but I may have been able to avoid that with a slightly smaller hole. bbqnut, thanks for the pictures. In your first picture, I see two hoses in the back, one a SS braided hose and the other plastic. (In addition to the new drain hose in the front). Is that SS hose the water supply line? If so, what is the other thing I see? You're seeing the water inlet and outlet connections to the rotary pump. bbqnut wrote: Basically what I did over a year ago to mine after the stock drain failed me. I had to use plumbers putty to keep it from leaking, but I may have been able to avoid that with a slightly smaller hole. Although this thread is a bit old now, it is very interesting to me because I want to attach a drain to my own Vivaldi II. I am wondering: Does all water flow into the hose? It seems that some water must be left - does this cause problems like smell? I haven't built drainage into my setup yet, Milchschaum (that means "milk froth," doesn't it? ), but the reinforcing beads across the bottom of the drip tray would have to retain a bit of waste. It does dry out too quickly to smell where I live. Others have said--and it makes sense--that keeping any trace of milk out of your drip tray and drain will prevent odors. MIlk is probably a lot more friendly to bacteria than coffee. However, if odors start to appear, a rinse with a dilute solution of bleach will be a powerful disinfectant that will remove all odors in short order. I attempt to detail how I installed the kit and how it's doing. As indicated by weska - the beads or slightly raised lines prevent the drip tray from draining completely. While mine is working fine for weeks now, there are no milk products in the drip tray to drain. I suspect that milk products would likely cause funkiness sooner or later. With only water and coffee products in the drip tray, in the short time I have been using the system there have been no problems. I can readily believe that putting/allowing milk products in the drip tray would eventually cause issues of some sort. No odors in mine at all. I clean it out periodically, about as often as I do a Cafizza backflush. Thanks for your answers, that helps me making my decision: I am going to try this. I am wondering which parts to use best. It seems like John Guest parts are not easily available here in Germany. You can get everything somewhere in the internet, but I can't just walk into the store and have a look and try. Does anybody know: What is the thing that bbqnut used, is it a JG-Connector with a screw like this one: http://shop.aquaexperts.de/product_info ... e69d3df1df? Milchschaum wrote: Does anybody know: What is the thing that bbqnut used, is it a JG-Connector with a screw like this one: http://shop.aquaexperts.de/product_info ... e69d3df1df? Except I think I used a 3/8" x 3/8" piece. I also drilled 4 holes at 90 degrees to each other through the threaded part of the elbow, taking care not to damage the threads, so that the drain level would be lower. mgannon wrote: I also drilled 4 holes at 90 degrees to each other through the threaded part of the elbow, taking care not to damage the threads, so that the drain level would be lower. I understand - that seems a good idea. One more question: Did you do anything that makes it possible to detach the drip tray from time to time to give it a thorough clean up in the kitchen sink? Can you do that using a JG junction? Or don't you think this is nessesary at all? Milchschaum wrote: One more question: Did you do anything that makes it possible to detach the drip tray from time to time to give it a thorough clean up in the kitchen sink? Can you do that using a JG junction? Or don't you think this is nessesary at all? Nope. That's the problem with my setup. If I want to take the drip pan out I need to disconnect the drain hose from the JG (Watts) fitting, and unscrew the fitting from the hole in the drain pan. I could avoid needing to unscrew the fitting from the hole in the drain pan if I enlarged the hole in the S1 chassis, but I don't really feel like cutting into the metal, and I haven't really had much need to remove the pan. Once a month or so I just run the water dispenser while brushing out the crud, and it stays clean enough. As I said, I've never had any kind of smells at all. It's me again - thanks to your help in this forum I was able to make my own drain kit. I think I found a good solution: You can still unplug the tube and take the drip tray off the machine for thorough cleaning in the sink. You have to cut the 1/2" hole in the drip tray quite exactly in the middle because the fitting is just a bit smaller than the hole in the metal base. Also you have to make the bottom of the drip tray even. You can shorten the fitting by quite an amount. I must be just long enough in order to screw the hose connector tight. This is what it looks like under the machine. That looks really great, the most professional solution I've seen so far. How long is that elbow though? It looks like your machine is raised up - was that just for the pictures, or is that to acommodate the height of the elbow? Yes, you are right, I am still experimenting with the hight. The ellbow part is a bit to high for my taste as well. I am tinking about swapping it to a normal straight hose connector and making the curve with the pvc hose. I suspect that the 90° ellbow also slows down the water - there is no pressure so you need any bit of gravity you can get. About the higher base: I already have door stoppers which are about 2cm higher than the original stands. Hopefully combined with the smaller straight hose connector this will be sufficient. Unfortunately, the spot where I can go through the counter top is not right under the machine but about 20cm left of it. If the taller foots won't be enough I will have to build a decent and good looking base for the machine. But I am shure I will get this thing to work properly this way or the other. 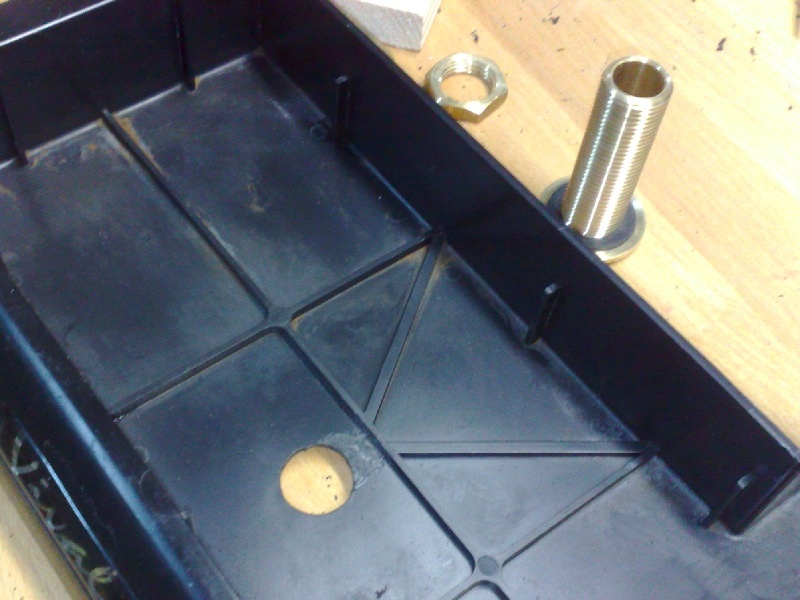 Here is another picture showing the inside of the drip tray. 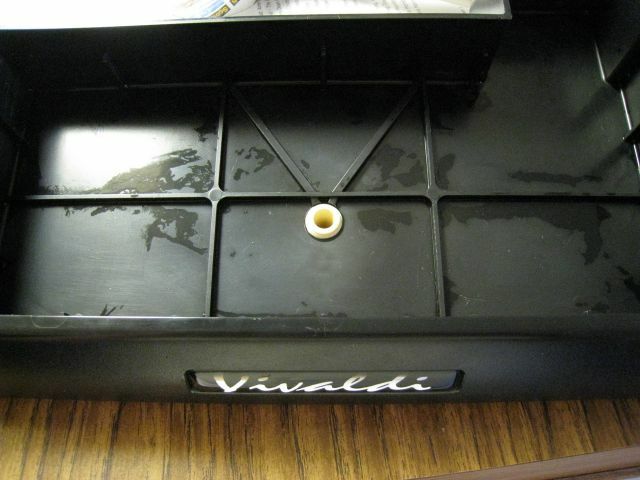 As you can see the fitting is about as high as the bars in the tray- So a small amount of water will stay in the tray - but I don't think there is anything you can do about that with any solution you'll find for the Vivaldi. So this drain kit works fine for me. What I like best is that I just have to disconnect the hose connector in order to take the drip tray off the machine. Nice work, Milchschaum. Looks as good as anything else on the Vivaldi, and the disconnect feature is excellent. You have me saying, "One of these days, I've got to get down to the hardware store." That is probably the nicest looking drain set up I've seen so far although I still prefer just dumping the tray manually. How far away is your sink? If you want to get the machine up higher taller legs can be adapted. I used commercial Cimballi legs I purchased from CC but they required a lot of reworking to fit. If you are handy with woodworking you could put together a nice base in about the same time it takes to modify the adjustable legs. The extra height comes in very handy when you are draining the boiler or doing other maintenance that requires removing the water line. Hello guys. I plumbed in my drp tray a while back but never shared it with you. Well I finally took a few pictures this morning. The reasons I think that it is worthwhile for me to post this are that, I used a side exit for the water and that I can easily remove the tray for cleaning and maintenance. Here is the view from the drip tray. You can see the fitting that goes through the tray and the retaining nut. The nut is in fact a ground down adaptor because I couldn't easily find a nut. Here is the back side view. 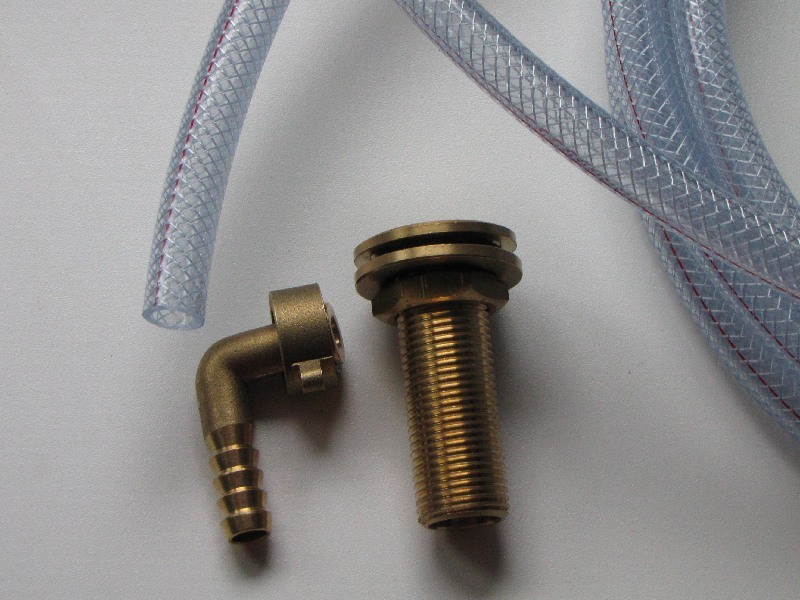 What you see is a 1/4" NPT to 3/8" compression elbow fitting with a brass washer. The fitting is crewed in the tray. I had planned for a gasket to be installed to sealed the joint but because the hole was just the right size the fitting is tight enough to seal on it't own. Thus the washer is not really necessary because there is no gasket, it gives stiffness to the joint. Next is a view of the drain line. 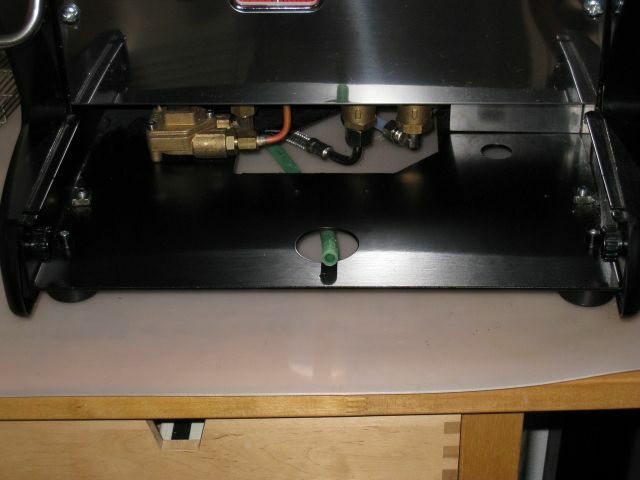 The orientation of the line and elbow is such that when the drip tray is installed the hose does not contact anything. Last edited by slo on Sun Nov 08, 2009 12:26 pm, edited 1 time in total. I tried a rear drain like this a while back (you can see the former hole covered up with a piece of foil tape in my pictures above: viewtopic.php?f=57&t=610&p=14759#p14591 ), but I never really got it to seal well enough, and the fitting I had used caused quite a bit higher water level than the bottom drain I eventually went to. How does your drain hose attach at the back? Any chance you could post a couple more pictures, maybe one or two with the catch basin out of the machine? Here you can see the real beauty of the setup. Because I left plenty of hose under the Vivaldi, I can easily reach into the sink to clean the tray whenever necessary without any dissambly. Frankly, today was the first time I did it, but it is really nice to be able to do it. Finally, the tray goes back rinsed nice and clean. You can also see where the line will end up under the pump oulet line. Complete installation cost $ 12.50 can from the reno store (including the under-the-sink hardware that I am not showing you ' cause I can't take a decent picture). Beat that if you can! Two additional point. There is no way that we can drain completly the tray no matter what. So the side installation is not such a draw back. Also keeping a bit of water in the tray hides the grounds at the bottom and does not create any odors. Hope that this will be helpfull to someone. Last edited by slo on Sun Nov 08, 2009 12:01 pm, edited 1 time in total. mgannon wrote: I tried a rear drain like this a while back (you can see the former hole covered up with a piece of foil tape in my pictures above: viewtopic.php?f=57&t=610&p=14759#p14591 ), but I never really got it to seal well enough, and the fitting I had used caused quite a bit higher water level than the bottom drain I eventually went to. How does your drain hose attach at the back? Any chance you could post a couple more pictures, maybe one or two with the catch basin out of the machine? I had noticed the tape in the back of your tray. Figured that the water level was your issue. Thanks, Sylvain! Good info, and an especially good optioin for people like me, with an original Vivaldi w/o the drain hole in the metal plate beneath the drip tray. 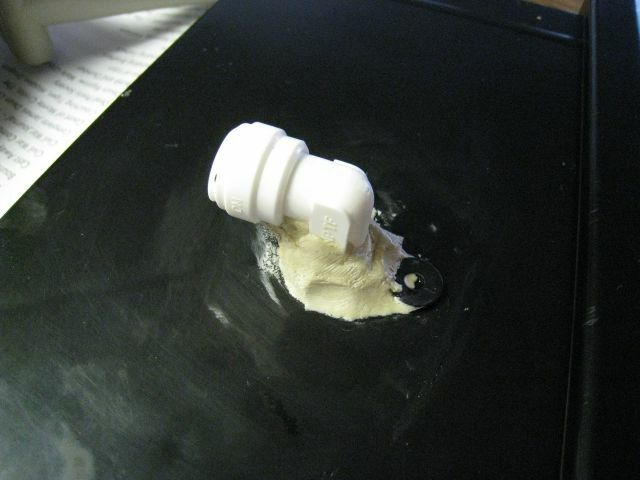 Milchschaum wrote: It's me again - thanks to your help in this forum I was able to make my own drain kit. I think I found a good solution: You can still unplug the tube and take the drip tray off the machine for thorough cleaning in the sink. An excellent and professional solution! Great job! Using Marine Vinyl-Ester Resin to make the bottom of the drip tray sloped such that it all drains to the center underneath the portafilter. The resin shrinks when hard so I'll need to fill the gap around the perimeter but I have little experience working with plastic resins but I presume they are similar to 2-part epoxies. then mount this quick release horizontally off the back vertical panel. A little liquid will pool but no more than what would be in the normal drip tray. I'd also cut off the hose barb. Then for the hose end use this. that would make it easily removable for full cleaning. Any thoughts? ....other than it being ludicrous that we need to come up with such extravagant solutions ourselves. A while back a friend and I were thinking out loud about the drip tray, and he mentioned that sort of resin too, just to build up the bottom, to get the ridges out of play. Then he said as the resin was curing he'd spin the tray so that the resin would move slightly to the outside and create a bit of a dish/crater, and mount an elbow at the center bottom. I opted instead to drill a 1/2" hole in the vertical back panel, push some 3/8" ID tubing through it (the OD is very close to 1/2"). Then on the inside I inserted the cut off barbed end of a plastic 3/8 fitting, and partially pulled the tubing back out of hole so that the barbs wedged the tubing tight against the wall of the hole. There's an 8" loop in the tubing between the drip tray and the hole in the countertop to give me some slack when I want to pull the tray out and disconnect it for cleaning. Totally leak-free and totally low-tech. that's exactly right. The ridges on the bottom are an amazingly stupid design. As for getting sloped, pour resin in the bottom, tilt the drip tray and let it cure. Pour some more in, tilt it the other way and let it cure. Anything is better than what it is now.I like your idea of just drilling a hole with the tube into it although the quick release is certainly easier than dealing with the hose barb. peter wrote: Totally leak-free and totally low-tech. And low cost as well! Bravo! The only issue I would see with this setup is the tube and barb coming loose. But if the tube is soft enough and the barb is well wedged, it should not be an issue. gsylvest wrote: The ridges on the bottom are an amazingly stupid design. My guess is that these ridges are there to increase the rigidity and reduce the risk of warping of the tray. As well, I could see that the ridges would be intentionally meant to retain some liquid in the tray. A semi-dry tray could allow growth of "bugs" and fungus that could create odors. With the water there is practically no odors. Finally, I am convinced that however thin the water layer, it reduces the splashing of water. These are just theories but they are why I no longer want to completely drain the tray. mgannon wrote: Long time lurker, bought my S1 about two years ago after much research, including on this forum. Thanks for all the info. I figured it was time for me to contribute. After becoming frustrated with the factory optional drain kit (not a great design) I fooled around with a couple different plumbing techniques. First I tried plumbing a line out the back of the tray. That worked OK, but it was a PITA to remove (and I found that I usually burned myself on the group head 5 or 6 times each time I disassembled the plumbing, given the way my hands had to reach in to unhook it). I finally went to a much simpler setup, with a press-in plumbing fitting (just like JG, but whatever brand Home Depot carries). 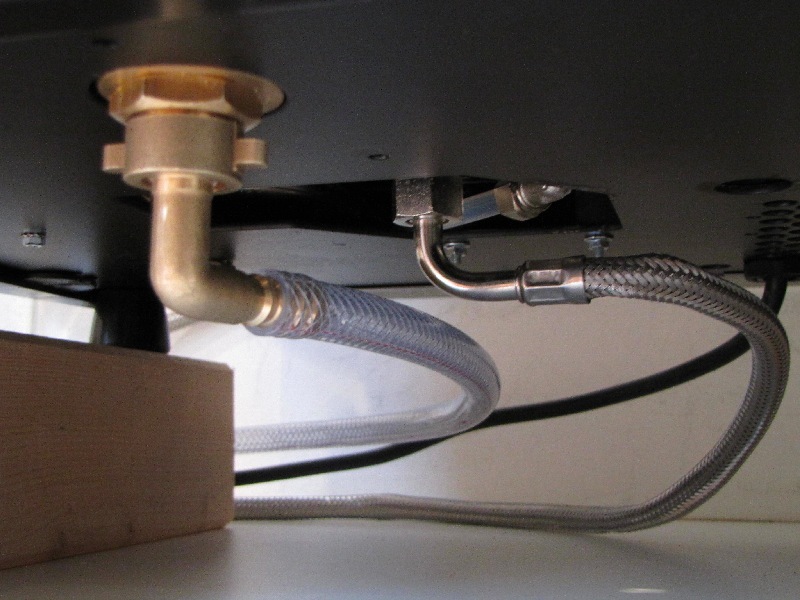 It is a 3/8" right angle fitting that the tubing just slides into. The other side is threaded, and screws right into the bottom of the drip tray. I drilled four holes in the sided of the threaded section to help with drainage. hi I was trying to take a look at your pictures for draining. Looks like the link doesn't work anymore. Do you mind sending me the pictures?